What a whirlwind four days its been, friends. I've just returned from Alt Summit and just like last year, my mind is filled with new ideas and my love for blogging is shining bright. There is NO place like Alt Summit. It is the place to learn from the best bloggers. Its the place to listen and meet the most-forward thinking brands who work with bloggers in innovative and creative ways. If you want to grow and make your blog more successful, Alt is where you begin. They give you the tools, the knowledge, and the connections. I loved catching up with old friends, like Nicole, Kirsten, Brianne and Jenny. It was great to meet people who I clicked with online and just knew would be awesome in person (Kate, Cyd, and Courtney didn't disappoint) and make new friends like Chelsey, Kirsten, Melanie, Sandra and Giulia. But the most fun was to meet people who had inspired me and touched my life over the past five years. Like Melissa, whose printable envelope I used for Chloe's 1st birthday invitation many years ago. She was just as sweet and kind as I imagined her. As a blogger, you think you're just sharing your life - but its easy to forget that what you say and do can leave footprints on other people's lives too. I've heard this message in the past and was always a bit resistant to the idea. I kinda liked being a random blogger, being spontaneously inspired by the world around me to write posts. Then Helen Jane from Federated Media said this: When you don't have an editorial calendar, you are only blogging in response to the last ten blogs you read. A calendar is your chance to push your blog further, to develop it in absence of other people's influence. 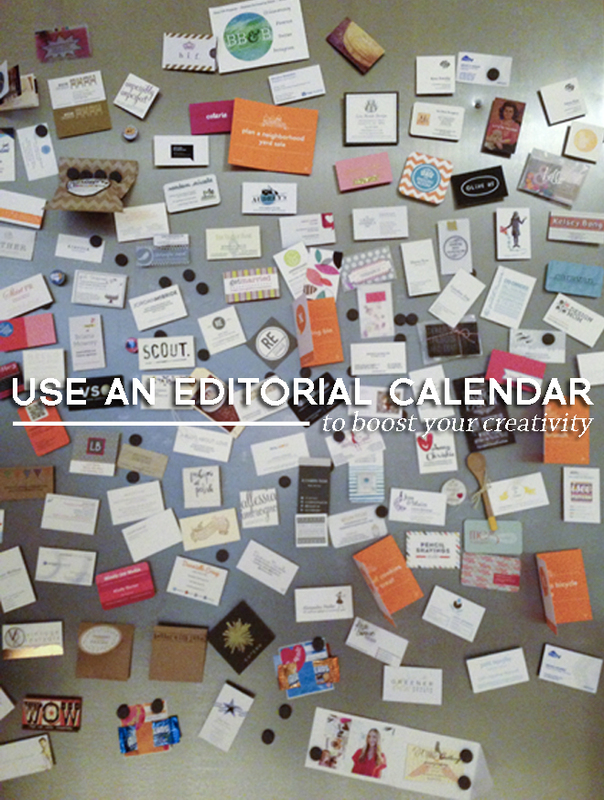 Translation: an editorial calendar helps you to be more creative, original, and have a stronger voice. 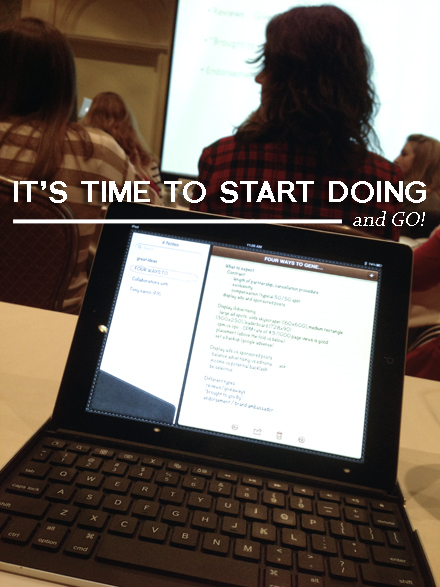 As well, it keeps you organized and makes collaborating with other bloggers or sponsors easier. Want to BE and DO better? Plan for it with an editorial calendar. We've all heard how important it is to "stay true to yourself" when writing a blog. 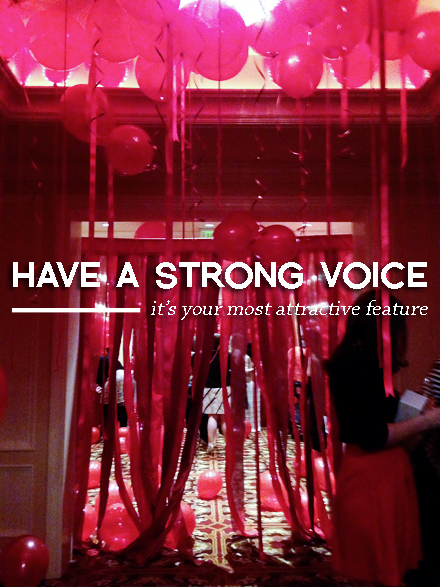 Your voice is what attracts and retains your readers. But it also attracts those people you want to work with. Want to contribute to another site? Put forward a different angle and viewpoint on a subject you are knowledgable on. Attract sponsors with a unique perspective and original ideas. Your voice should carry through your entire brand - be consistent in the fonts and colours you use and the way you take your photos. People should know your work when they see it. So many times from so many women (myself included), I heard the phrase "I don't know what I want to do with my blog". The first step: decide what success means to you. There are bloggers who want to make money from their blog. If that's you, then research affiliate marketing and ad networks and e-courses and implement the method that is right for your blog - and value your time and really scrutinize what you do for free. There are others who wanted to be writers and book authors - so start by contributing to other sites, doing freelance work, and approaching publishers. Many want to work with sponsors. How to do that? By reaching out to contacts, networking with other bloggers, finding out who can help you. And when you do land that big meeting with Anthropologie or Kate Spade, know what you want and be unapologetic about asking for it. There are so many roads to success. You just have to choose a path and start walking. In a nutshell, Alt Summit taught me (again) that your blog can be whatever you want it to be and those who hustle and work hard at it, can reap the rewards. It also reminded me that I'm not alone. If I need help, I should ask for it. Bloggers are the most supportive, collaborative, creative people you will ever meet. Our passions bind us together. I hope I see YOU at Alt next year. oh man, ALT looked like SUCH a good time. I would love to go sometime. I've really been needing some direction with my blog lately and I'm gaining so much even just reading the recap posts. Thanks for sharing, Jen! You have no idea how honored I am to be called one of your "old friends" (and to be put in a series of links next to Nicole ;) I hope we can really continue to grow our friendship online this year - you have lots of wisdom i can't wait to mine. WooHoo! I was going through my reader all sleepy until I read this one, and now I feel like jumping up and DOING SOMETHING dammit! :) I am so glad you got so much out of ALT this year, and extra glad you are willing to share your learnings with us. Oh yeah, my evil plan worked!! Really nice to meet you. It's fun to meet the real face behind a blog you love to read. Thanks for being approachable and real. Thanks so much for sharing Jen! You've always been so generous in sharing your knowledge and wisdom with us. ALT sounds truly like a life changing experience and definitely an eye opener for bloggers to (1) start search for the right path, (2) how to pursue your dream, and (3) a fantastic network to support fellow bloggers! I so need to think about what I want to accomplish for DM in 2013 and editorial calendar... I started one last year, I better get back at it starting February! Welcome back and can't wait to meet up with you soon! Oh, the weekend sounds AMAZING! Love your take-aways. So pertinent. So easily forgotten. Wonderful post, Jennifer! Alt summit must be so inspiring! How I wish I had the funds and time to go. It is always fabulous to hear what you came away with, the ideas and plans! Thanks for sharing. And it is true, the blogging community is so supportive and encouraging! You're one of the MOST supportive Barbara ;) Start saving your pennies and I'll see you at Alt next year! so good to hear that you had such a great time and that you left completely inspired! thanks for sharing the tips! Alt sounds just amazing. Your energy just oozes off the pages of your post. Thank you for sharing your thoughts. I've been stumped by blogging lately and appreciate your honesty, energy and inspiration. Alt has a way of doing that! I was feeling stumped too before I went to the conference but now I have a bit more clarity. Hope you find your way too.